The only watch a golfer will ever need. 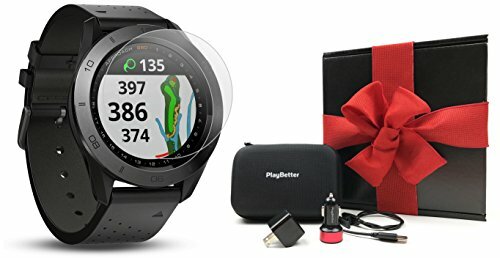 It's stylish, has amazing golf functionality, activity tracking and now features multi-sport activity profiles for running, swimming and cycling! You'll never want to take it off! The Premium version features a ceramic bezel and black leather band (compare to stainless steel/silicone of regular version). The screen is 20% larger than it's predecessor and is designed for perfect readability in bright, sunny conditions. Easily add/remove bands to match any outfit. No longer is this watch only meant for the course. Activity profiles for running, swimming and cycling allow users to keep their all-around fitness high while using just one GPS watch! Full access to the brand new Garmin Golf app, where you can easily analyze and share all that data you've collected on the course. PERFECT GIFT BUNDLE - the Ultra-Clear Glass Screen Protector and PlayBetter Hard Carrying Case will keep the Approach S60 looking brand new while the USB charging adapters will ensure you're never without a charge again!